or weekend (Sat, Sun). 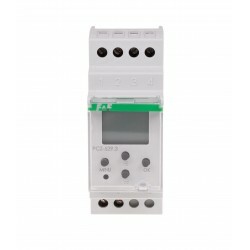 The timer has two independently programmable channels. 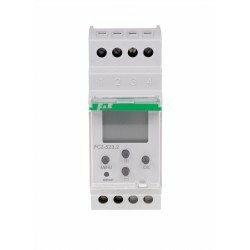 CHANNEL – program line with individual entries for ON-OFF COMMANDS, which controls its own contact for enabling the receiver. ON-OFF COMMAND – program entry for enabling or disabling the receiver. 500 MEMORY CELLS – memory for individual program entries that allows to program 250 pairs of ON-OFF COMMANDS. * single day of the week: Mo; Tu; We; Th; Fr; Sa or Su. * working days: Mo Tu We Th Fr (Monday to Friday). * daily: Mo Tu We Th Fr Sa Su (Monday to Sunday). CURRENT PROGRAM PREVIEW – pressing the +/- keys in the date preview mode displays information about the number and details of the current program. 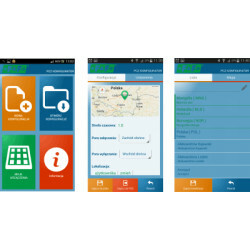 PCZ Konfigurator APP - free application for Android mobile phones and tablets equipped with the NFC module for wireless communication. CLOCK TIME CORRECTION – set monthly adjustment of the seconds of the system clock. LCD BRIGHTNESS ADJUSTMENT - change the contrast of the display to get aclear LCD read-out from different viewing angles. Currently sold is a PCZ-522 clock with index 3 (PCZ-522.3). It is an index denoting the version of the clock software.